The entry fee to the challenge is a mere $1.00 which goes to benefit World Teacher Aid which was set up by another marketer, Stu McLaren and his wife where they have built schools in developing nations. In exchange for the donation, Russell Brunson is giving me and anyone else who takes part, full access into his Dot Com Secrets X program as well as his recent “Illuminati” program. So what does that entail? Access to just about every one of their (digital copy) monthly newsletter full of every major marketing tip you could ever think of. Access to hours of training videos from many of their top live training seminars where you can get a close look at getting your business started. Access to multiple streams of free traffic and the training to use it. Access to much more including the training for the challenge itself, where every day you will have a short video (the first is longer though to get you set up) detailing your task for the day. For example, days one and two so far dealt with going through the system and setting up your offers and affliate links in addition to gaining some of the free traffic techniques. Sharing the challenge was another key goal in helping Russell Brunson and Stu McLaren to build another school! Again for just $1 and you get 30 days with Russell, to learn about many aspects of building your online empire and earning lifelong residual incomes. If anything, you learn whether you are cut out for the internet marketing world and your only investment amounts to less than 4 cents a day. Now this does continue into a 90 day challenge as well and if you decide you are doing well and seeing results, stick with it and become a paying mamber of the DCS-X which is going to be $97 a month through clickbank. As an affiliate for Russell Brunson, I would make a commission and wanted to share some killer bonuses with you to nudge you in the direction of taking part in the challenge as well as getting the full year as well as other upgrades. So just for joining the challenge, I am going to give you your choice of memberships. Send me a comment, post, PM etc. with the details you signed up with for the challenge, especially because we need to act as each others accountability partners. We need someone to keep us on track in our progress, especially as this will need your participation at least once a day. The next bonuses come when you join at the upgraded full year special. This is what I will send you. A) I will mail you a physical copy of Mike Filsaimes Butterfly Marketing Manuscript (155 pages) as well as a DVD with the manuscript and his best selling Viral Friend Generator and PowerLink Generator. You will hear Russell talk about Mike in the video you see later. B) I will mail you a copy of my BasicWebinar DVD which teach you about bringing quality content to your viewers in live settings online. C) I will make sure you are keeping up with your work by staying in touch by phone, email or text messaging, Facebook etc. Major Bonus #2: part of the system works by helping you give away a free website and capture people into your own downline through GVO (where you will actually host the website etc.) if you join GVO, and pay for a full year (About $100) through this link only I will hook you up even more! So as you can see, you will win either way! You win by learning from one of the best marketers (Russell Brunson) today! You win the most when you have a system to keep your leads with GVO so you can email them in the future as well. So go check out the challenge today and keep me posted! Not only is the cartoon cool here, but so is Mike Filsaime’s Franshise Model for Business success. I am training to be an IMA in Russell Brunson’s Dot Com Secrets Local. I put together this short video tonight showing you my back office and talking a little more about becoming a local media manager and what it entails. Did the ‘Guru’ give you a bonus for this? they thought it was not worth it…Well lets show them what’s up. If you click the image you go right to the video and miss out on my bonus. as how to save $10 on this inexpensive $47 software. The above “SNIPER” deals with MLM, or Multi-level marketing books. You may be just breaking into the industry, or might be looking to improve your seasoned ways and reading will help you establish or maintain your focus. MLM has been around for years, often gaining a bad reputation due to the pyramid feel to it. In some cases, it truly is the top of the line that only gains success, while in others there are multi levels where success can be achieved. When you are getting into a MLM, you should carry out your due diligence and research the company and its requirements fully before you jump in. Otherwise, you might end up losing a lot of money on buying products that fill up your garage or basement. You should also realize that MLM is actually a great way to break into the business field. There is no other place where you can get an endless amount of training and support for a limited amount of money. Compare this to opening a major food chain, and you are talking an investment that is pennies on the dollar. Recently I read Robert Kiyosaki and Donald Trump’s novel, “Why we want you to be Rich” and even they both support MLM for the reasons of low start up cost and extensive training. Where else could you fail and not get fired for continually being willing to try to improve. I am currently involved in MLM related to online marketing products. I like them because the cost if very competitive, the service is phenomenal and I can promote the products to other marketers and businesses who have a need for these services. The best thing is that my garage is not loaded with boxes I need to ship out. If you are interested in MLM, I highly recommend and endorse the following. If you have a business or are looking to start one, these services will only improve your standing online and in your customers eyes. GVO Hosting: I have the Titanium account with unlimited hosting, autoresponder, online conference rooms and more for just $45 a month. GVO Host Then Profits: This is the starter version of the above with basically the same package, but limited to 4 domains hosted. This is perfect for someone just starting out and getting their online presence built. GVO-Conference: Provides webinar services, desktop sharing, audio/video/text chat in live form for customer service, live trainings or just keeping up with friends: I have $10/month account with this for 100 seats. Meet Cheap: This is the starter version of GVO-Conference where you can get a 20 seat online conference room for just $1.67 a month or $20 a year to use for your self, or can also upgrade to the 100 seat room and become a distributor for $10 a month. I welcome any questions or comments you have in regards to any of these packages and remind you that often MLM requires you to invest a couple hundred dollars a month in products you are pushing out to others. You could pick up a couple of these accounts above and still have money left over to build your business. In the above example, I have placed a “sniper” for Tablets, as these are some of the most popular electronic devices out there today. This is just one of thousands of products I could add to to a website. 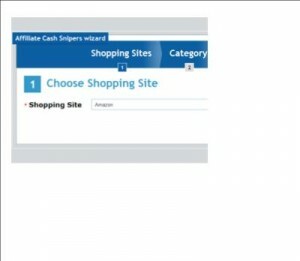 Step One: Choose the site you want to use: Amazon, Target, Overstock, eBay etc. Step Two: Choose the category you want: Baby, Clothing, Computers, Books etc. 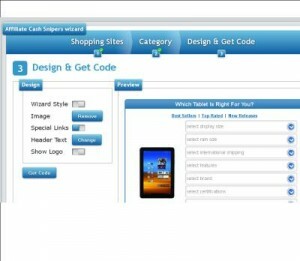 Step Four: Choose your design: Add images, change your heading and more. 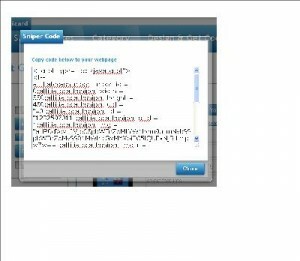 Step Six: Paste into your website: Notice the example in the picture above is the “sniper” you see in the blog post. Step Seven: Send traffic to your blog or website: This of course can be done by numerous methods following whatever you are most comfortable with. Some key generators of traffic are social media sites like twitter and facebook as well as posting blogs or running solo ads. In addition to the killer software for Affiliate Cash Snipers, you are also going to get a couple complimentary softwares as this is a 3-in-one package! You are also getting “Best Seller Sniper” and “Ad Spot Sniper” as well as PDF user guides for all three. Depending on your choice of upgrades, you will also get advanced training and hot sellers. 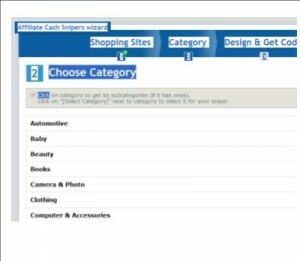 The Best Seller Sniper allows you to quickly find out what products are the top sellers in all the marketes so that you can streamline your Affiliate Cash Snipers on your websites. 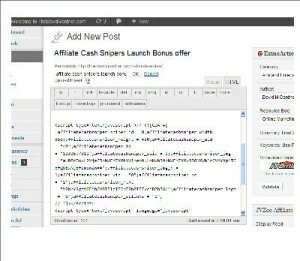 The AdSpot Sniper is a software that allows you to find what websites are the best places to run your ads. You will be contacting people to place ads, so why not place one that is interactive to the customers choice and not one specific item. Let’s look at that fact again. Snipers let the customers choose what they want to see that fits them best, instead of just looking at one individual item that may not fit their needs. This is where the exploding of your affiliate sales comes into play. In the past you might just put up an ad that links to one product and loses a persons interest. Now they can pick and choose as they please. Once they are on the site, they will also be cookied to your affiliate link, so if they buy anything else on the site (during this visit), this is also giving your commissions a nice boost. Unlike your typical sale which might never happen or stop at one item, this provides multiple choices to fit the needs of your viewers. You should be excited to Get Your Affiliate Cash Snipers Now! I know I am excited to use it on all of my websites. I have many in multiple niches and now I can add one more great way to monetize my sites. My Affiliate Cash Snipers Bonus: It would not be a sale without Bonuses right? You have to use my links and see “baresales” on your clickbank order form in order for you to qualify. I am here to help as well as the big guns like Michael Rasmussen and Mike Mograbi, who have come up with this great software. 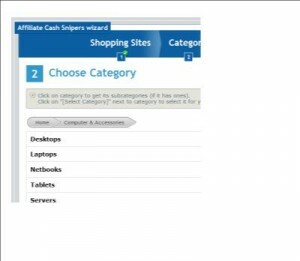 Now it is in your hand to to come over and pick you your Affiliate Cash Snipers today! 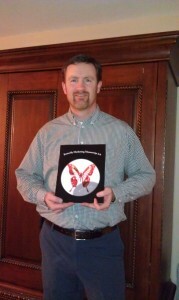 After a long awaited time, Affiliate Marketing 3.0, the Revolution is now available for your reading pleasure. This 23 page report shares with you the changes that are occurring in the affiliate marketing world and what you can easily do to make this work for you in 2012 and beyond. Now for the most part, internet marketers seem to want to always promote the IM products of other internet marketers. What many people do not realize is that there are millions of other products out there that can be promoted online and earn some easy commissions on. Books, movies, clothing, concert tickets, insurance and much more can all be promoted. These are things you are buying anyways, right? You most likely have even given someone a reference towards similar materials and never got a commission or kickback from the parent company. Don’t you think it is time you got your thanks! 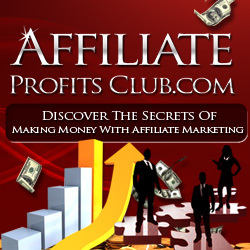 Becoming an Affiliate Marketer can help, even for those with limited knowledge of websites. Read the Affiliate Marketing 3.0 Report by Michael Rasmussen here. Think about how many times you have told someone you got something at Target, JCPenny, Walmart or even on Amazon.com. Your friends then go and spend their money at these places. What do you get? Nothing. No bonuses, no commissions, nada! It is time for a change. When these stores online have customers visit their sites, they are able to customize their experience and give them exactly what they want. Wouldn’t it be great if you could do this for your freinds and list members? The Revolution is here. You will be able to do this with what Michael Rasmussen has in store with his latest product called Affiliate Cash Sniper. I just was granted a demo access to Michael Rasmussen’s Affiliate Cash Sniper. He teamed up with Mike Mograbi to take affiliate marketing to a new level where your viewer can literally be shown their top choice of a product, instead of being limited by only what you have to offer you your site. For example, I have a “sniper” set up below. This one focuses on external hard drives: Now I could just put up a link that goes directly to a specific hard drive, but that would limit the amount of options you might have. As you can see, this shows an example of some pretty advanced software that will integrate your affiliate codes as well as products to bring you, the customer, exactly what you want in a product. 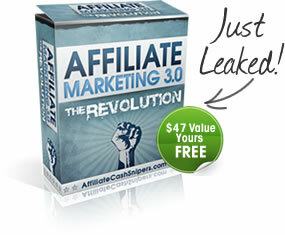 If you want to get your own Affiliate Cash Snipers, like this, just start by reading this article on Affiliate Marketing 3.0: The Revolution. and be sure to leave a comment below. Even better, use the sniper above and run a few tests by selecting different categories and/or brand and you can see how it will take you (or your viewers) to multiple different items pinpointed to their interests. As a heads up, the software does run on a Java Script, so this is something to be aware of with your websites and visbility. So Marketing with Anik lesson 1 just finished a few minutes ago and I have been playing around with some of the ideas I picked up tonight. You can still join Marketing with Anik and get all the recordings from the previous webinars in the members area. I think that the information I gained tonight could well be considered worth the $37 it will cost you for the whole 15 week course. In addition, he is also throwing you about $5000 worth of his own best courses to sweeten the pot as well. Anyways, the major scope of tonights lesson #1 was keyword research, where he went through things like the google adwords tool, google trends, and google suggestions. He went in depth in regards to showing what type of keywords you should be looking for as well as the number of searched per month and total you should be looking for to determine whether or not it is suitable to compete against. The one part that was somewhat awakening (though it really should not have been) was the idea of magazines related to keywords. Taking a quick look aroung your local bookstore or grocery store, if there is a magazine about a topic, there must be a large enough population of people interested in the same topic. If it is one you are passionate about, even better. When you go to check out BestDeal Magazines.com you will need to search for $5.95 subscriptions under the “shop now” left sidebar. If you are reading this post you are most likely somewhat interested in making money from home and this is the perfect magazine to provide you with some great ideas to get started on. If you like other subjects, you are in great shape too, whether you pick something up for yourself, a kid, spouse of friend/neighbor. There are plenty to come read about th Best Deal Magazines. The important thing really relates to the fact that you are reading and stimulating the mind, whereas many others never will never continually stimulate their brain. Once I get some rest tonight, I will be ready to go tomorrow and be able to take action on more of what I learned Marketing with Anik lesson 1 today.